A study performed by researchers in Korea have demonstrated that children that watch more than 2 hours of TV per day are at greater risk of language delay than children watching less than 2 hours of TV per day. Parents and health professionals alike, have long speculated about the negative implications of “too much TV”. And while the psycho-social impact of TV watching has been the subject of extensive research, the relationship between watching ‘a lot’ of TV and language development have until now been unclear. Previous research studies on this subject have been limited in the number of subjects used, or the survey methods have been inaccurate and have not been adjusted for variables that could undermine the quality of the research results. The study accounted for a range of confounding variables that could undermine the quality of the results, including carer arrangements, household income, size of home, mother and father’s education, toddler’s gender, sociability and more. The peer reviewed study which involved 1,778 toddlers in Korea has demonstrated that children watching more than 2 hours of Television per day, and less than 3 hours of Television per day were at 2.7 times more risk of language delay than those watching less than 1 hour of TV watching time. Those with more than 3 hours of had approximately 3 times greater risk. 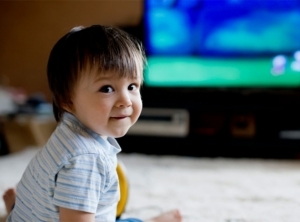 The research by Haewon Byeon, titled Relationship between Television Viewing and Language Delay in Toddlers: Evidence from a Korea National Cross-Sectional Survey was published in the PLOS One journal.